This page last revised September 14, 2015. GoDaddy has everything you need to reach your online business goals. Save on everything from basics like domains and websites to marketing tools that will help you grow for years to come. 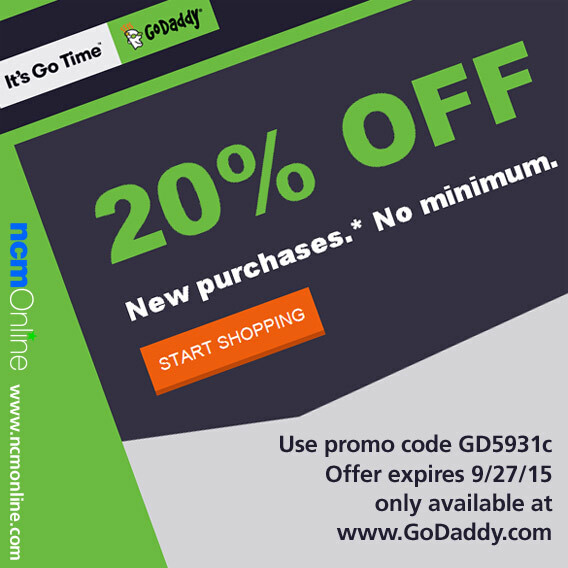 Shop now to save big with a 20% discount on your new purchase from the GoDaddy catalog of products and services. Use promo code gd5931c in your cart when placing your order. Offer expires Sunday, September 27th, 2015 at 12:00 AM (MST). Never miss a payment from a customer. Accept credit and debit cards, plus ACH payments, from email invoices or even your phone. Visit GoDaddy now to learn more about keeping your finances organized all in one place with their online bookkeeping services. Easily list your business everywhere online. Showcase your phone number and address on top sites and search engines. Visit GoDaddy now to learn more about getting your business listed with the top search engines and web sites. 20% off coupon code savings not applicable to ICANN fees, taxes, transfers, premium domains, premium templates, Professional Design Service fees (including Web Design, eCommerce Design, and Logo Design), gift cards or Trademark Holders/Priority Pre-registration or pre-registration fees. Offer good towards new product purchases only and cannot be used on product renewals. Cannot be used in conjunction with any other offer, sale, discount or promotion. After the initial purchase term, discounted products will renew at the then-current renewal list price. 20% off offer expires Sunday, September 27, 2015 at midnight (Mountain Time). Certain elements of this page: Copyright © 1999-2015 GoDaddy Operating Company, LLC. 14455 N. Hayden Rd, Ste. 219, Scottsdale, AZ 85260. All rights reserved.